First thing, I mentioned something similar to this observation when I talked about the most recent Mad Max film. Basically, this first thought is film quality. I can’t quite remember when it was during the film that it hit me. I think it happened about the time that Sarah Conner and Kyle Reese had stolen a car to escape the machine. This was a short bit before they ended up at the police station. It was all in the film quality. This seems like such a strange thing to experience but I realized that many of the movies today are coming out so clean, so perfect, so sanitized in the efforts to make them look like real life. The quality of the cameras and technology have sanitized our film experience to a point where nothing looks like real life anymore. This is more than just CGI. It’s the quality of the picture itself. Life has rough edges and blurred lines. I honestly think that the fuzzy and almost grainy nature of old film leads to the fuzziness of our memories. When we see the movies we are able to easily digest them as memories. And as memories they have become a part of us. I don’t think we have that so much anymore. Although, that could just be signs of me getting old (get off my lawn). There was another observation in there too. This one struck me as a little funny. It goes into the indestructibility of the terminator itself. Who among us has dropped a cell phone, or maybe a laptop. Think about that for a second. As our tech becomes more powerful it becomes more fragile. The terminators are incredibly advanced cybernetics, and yet they are resilient and able to withstand all sorts of damaging situations. Imagine what level of progress they must have made with gorilla glass and titanium chassis in what not is only a few more years away. From a more modern perspective though, what was almost trippy when the movie first came out is a bit dated at this point. I’m referring to the final segment of the story when they are in the plant and the skin has been burned away from the creature. Sure they made a great looking robotic model. But because of the tech of the time of filming, the blocky motions of what I am pretty sure was a bit of stop motion filming, well, it kinda gave a comical feel to what was once an intense scene. This would have been a moment where today’s tech would have aided the film and kept it to a realistic level. CGI could have fit in perfectly in the murky light of the plant they were in. The music would have fit the visuals and we would still feel the desired effects of the scene. Instead, I was rooting for Sarah Conner and just wanted her to put the thing out of its misery. Now, the last bit I have for this right now, is the final thought of the tech. 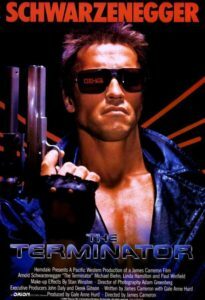 I find it interesting that the way they portrayed the terminators in each movie rose with the tech available for filming and special effects. I mean you expect that right? But it’s really a bit of poetic justice. This movie has been outshone (special effects wise) by its successors, just as in its time it had been a huge upgrade from the story the plotlines were stolen from. Yeah, if you didn’t know already, this movie had been stolen almost directly from a story written by Harlan Ellison (ooo lookie there, I got to work him into this). The Soldier had been a story on the original Outer Limits that had a similar look and feel to the terminator series. Now there is a ton of speculation into the lawsuits and such that arose from this but this isn’t the place to discuss it. I am more interested in the progression of the technologies and how they changed the look and feel of the stories in comparison to the Terminator. In each iteration of this variation on the same story the special effects make everything look better and better. It’s almost like a time loop where the subtle changes have changed not only the future but also the past where everything is taking place. Almost makes you wonder if they might hit so many paradoxes at some point that Sarah Conner might even be her own mother. Yep, I ramble, and there really isn’t a point. I still love this movie, even with all the oddities I can pick out today. Sometimes we find a story that just sticks with us no matter how many times it is done and redone and changed to make it into something just a bit different than before. And then there are times where none of that works, but that is a talk for a different time.